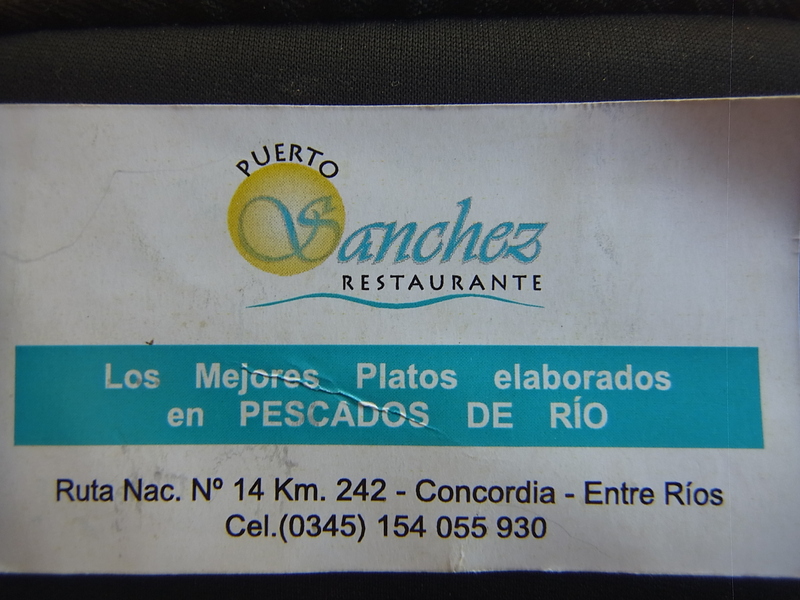 The first city we come across in Argentina is Gualeguaychu, around 40km from the border. Our initial plan – to look for a campsite – falls literally into water, like we say in Germany. 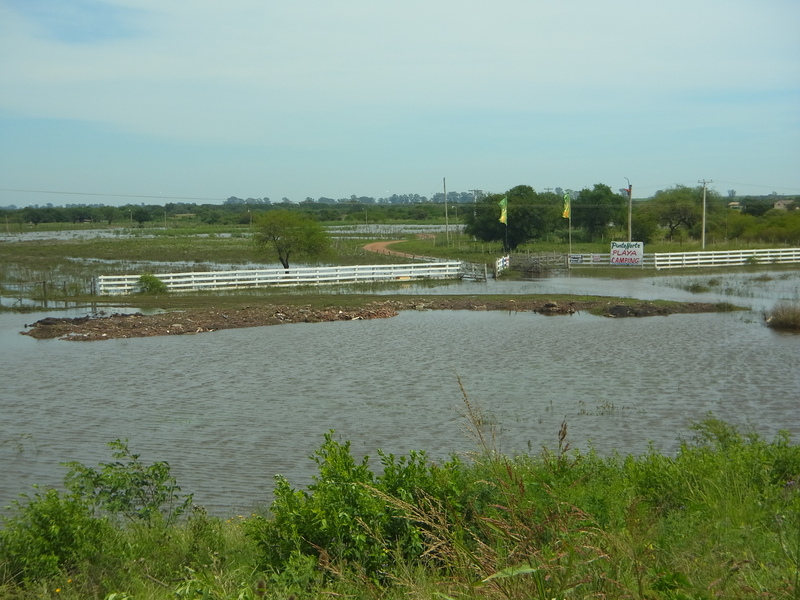 All campsites along the river are flooded. As we start looking for a hostel instead, we find them all extraordinary expensive, finally we get a hotel room which is actually cheaper than two beds in a shared hostel room. Gualeguaychu is a big city, with a rather crowded city-center but not much more. 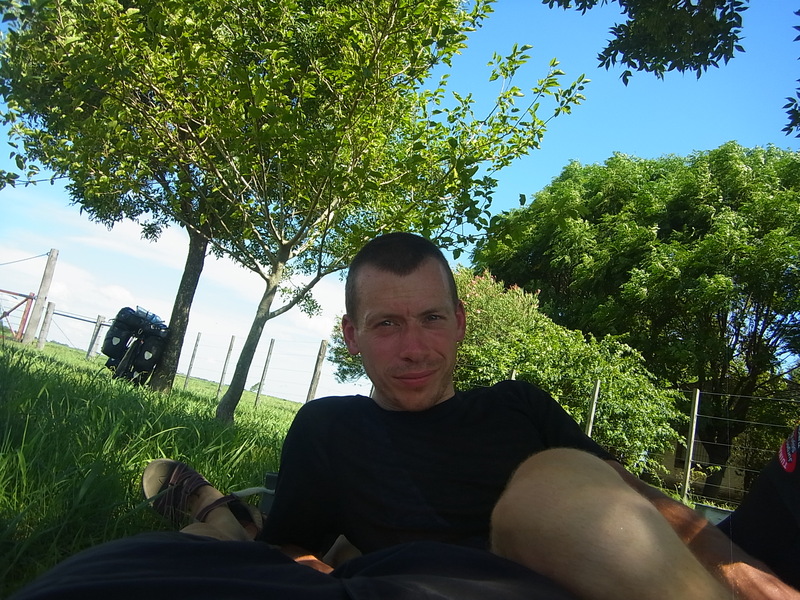 The next morning, under a crippling heat, we cycle northbound out of the city and than on to the Ruta 14. 30km go by without anything but the sun, the road in front of us and flat grassland to the sides. Then a small hacienda appears and we can rest a little bit in the shadow of the first tree we see this day and ask for some water. 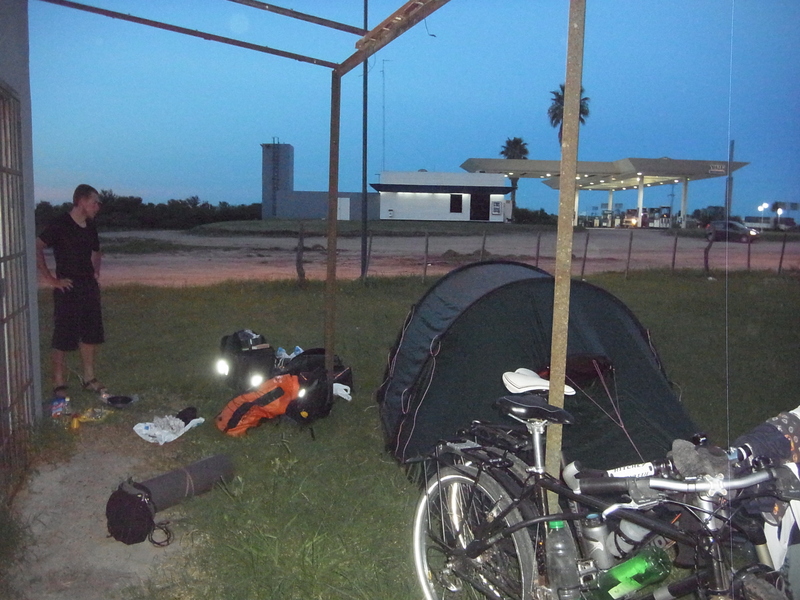 The first gas station we reach is around 45km from Gualeguaychu, under these cycling conditions a full days´ ride. The tormenting sun and the 40km/h headwind make riding killer (even if we appreciated the wind since it made the heat bareable). The next morning brings clouded weather, but what is better for us: tailwind! We push on to Colon (a bit further than we estimated looking on the map) arrive in late afternoon and find to our surprise a touristic hotspot. Nearly every house offers rooms to rent, there are numerous campsites and, as we find out later, there is a lively nightlife in town which makes sleeping difficult. Despite the noise we stay for another night because we are both caught by Montezumasˋ revenge. Than we give in and move on to the next small village, San Jose, where we find a beautiful and quite campsite directly alongside the Rio Uruguay. 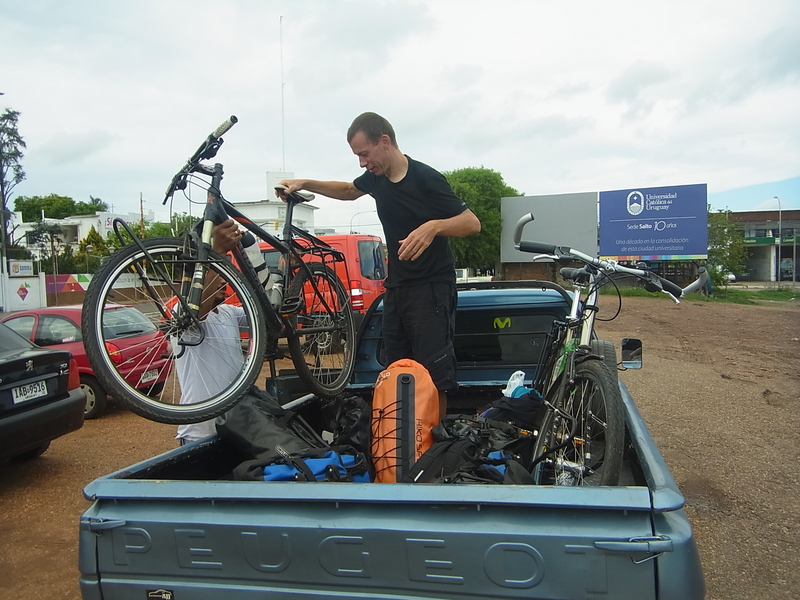 After two more days we are sufficiently recovered to start cycling again. We leave the peaceful “El altiguo Muelle” and head back to the busy Ruta 14. 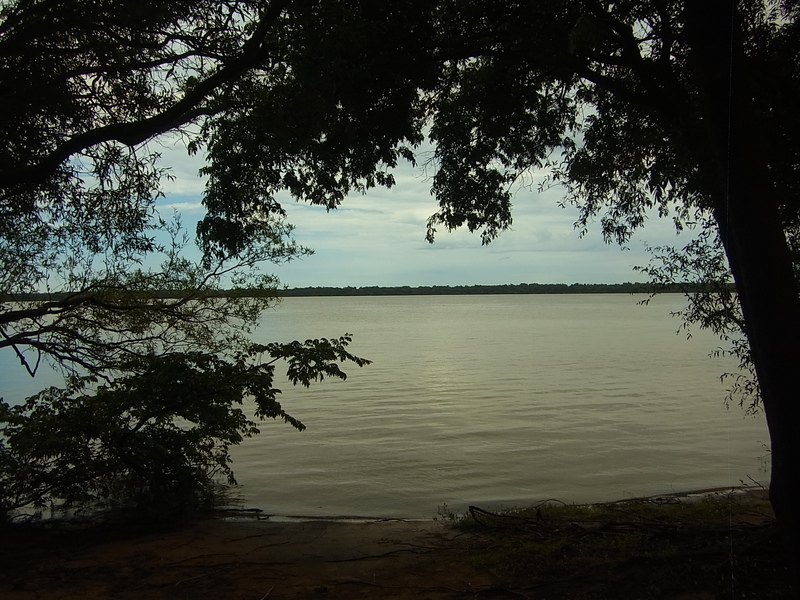 In the afternoon we reach the Nacionalpark “El Palmar” with the last big population of Yatay-Palms, which were originally a regular part of vegetation in the Entre Rios area. Unfortunately its too expensive for us to camp inside the park, instead we again stay at a gas station for the night and have nice company of two Argentinians who commute between Santa Fe and Ubajay (the next city) and are regular campers at this gas station. They travel with a pick-up instead of bicycles and bring even wood with them to make a fire under the water tank for a hot shower. For this time it´s our last day in Argentina, but we get a nice surprise. 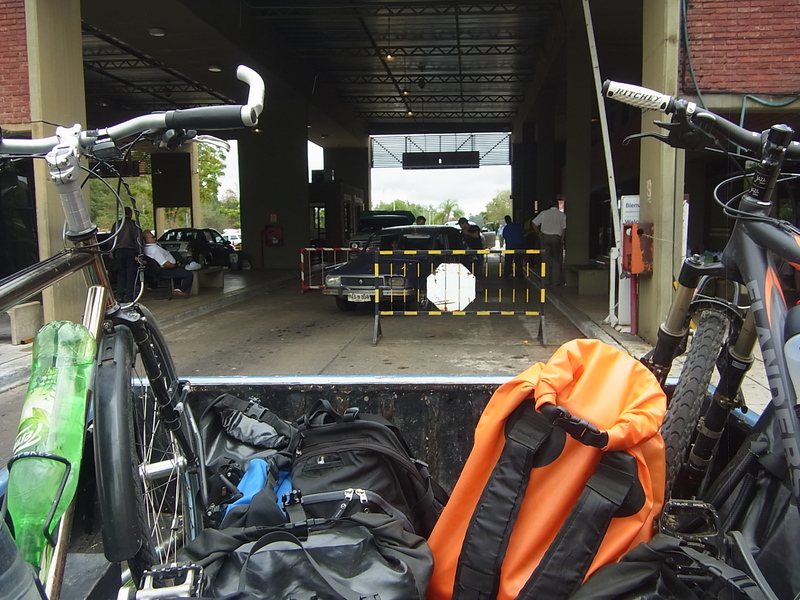 Than we spend just one more night in a nice hostal in Concordia (hard rain and oncoming thunderstorms force us to seek an alternative accomodation to camping) and the next morning we cross the border back to Uruguay.